Let’s be real: prom is complicated. It’s an exciting, fancy night that requires a lot of prep work to make sure it ends successfully and memorably. 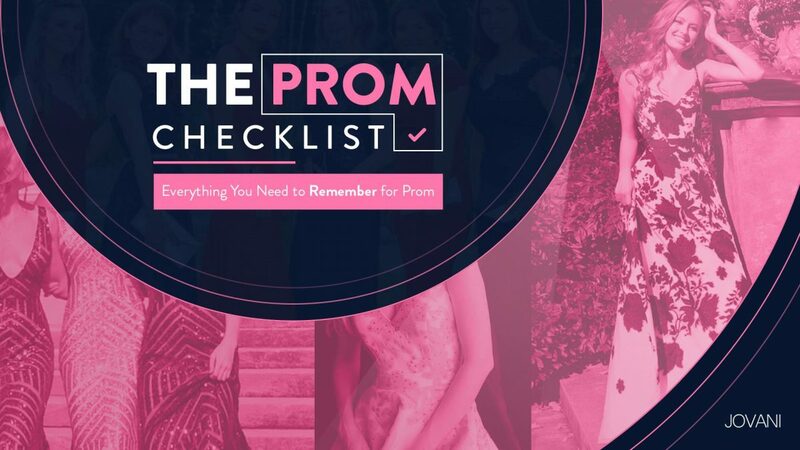 You may not know where to start with your prom to-do list, so to help, here is the ultimate checklist to help you prepare for the big day. The month before prom is when you should take care of the biggest parts – namely, finding your dress and booking any hair and makeup appointments. It may seem silly to do all this so far in advance, but it’ll help you avoid rushing at the last minute. That means prom dress, shoes, accessories, jewelry, and, yes, even underwear. Try on everything all at once to ensure it fits and that you can move around comfortably. If you’re doing your own hair and makeup, do a trial run to make sure it looks to your liking. If you find your dress doesn’t quite fit like a glove, consider getting it professionally altered. A professional tailor can measure your body and make tiny adjustments to make your dress fit better. If you’re leaving your hair and makeup to the pros, now is the time to schedule your appointments. If your group is renting a limo or photographer, now is also the time to contact each company. Do NOT leave this until the last second, or else you run the risk of everyone being fully booked by the time you call! When exactly tickets go on sale depends on your individual school, but generally, you can purchase them a few weeks before the big day. Make sure you get your tickets as early as possible. Prices usually go up the closer you to get to the event and can even (gasp!) sell out if you wait to get them at the door. The week before the event should be about handling the smaller details and confirming times and dates. Check your tickets, your appointments, and the schedules of everyone in your prom group. This can help to minimize any last-minute surprises. It’s time to scope out the perfect arena for your day-of photoshoot (assuming you plan to go somewhere farther than the front steps of your house). If you’re working with a professional photographer, you may have already discussed this. If not, you’ll want to pick an area that has good lighting and isn’t too busy during the time of day you’ll be snapping pictures. Backyards and staircases in the foyer are great locations, so don’t get too hung up on the background if you can’t go somewhere special. Remember, you are the focus on the photos, not the scenery. And don’t forget to check the weather forecast! Does everyone know where they need to be and at what time? Send a message to the group chat clearly laying out what time photos are being taken and what time you’ll be heading to dance. Have everyone confirm who’s carpooling with who and plan out where you’ll be headed for the after-party. If you’re relying on parents as chauffeurs or photographers, make sure they all involve understand their role and the schedule. It may seem like a given, but be sure to actually ask for their help if you need them to drive you somewhere. Yes, you’ll feel silly, but it’s a good idea to prance around the yard in your new stilettos before wearing them for six hours for the first time at the dance. If you need inserts for a little extra cushion, you’ll be happy you know now instead of when it’s too late. Call up the florist and get the corsage or boutonniére for your date ready – and make sure your date has flowers ready for you too! If you pick up your flowers before the big day, store them in a sealed, airtight container in your refrigerator to avoid wilting. There’s no need to feel frantic in the time directly leading up to the actual event. If you’ve been planning properly the past few weeks, you’ll have nothing to worry about. The night before and day of prom should only involve things you couldn’t have done in advance. Attend your hair and makeup appointments, take photos, and get ready to have fun! The night before should be devoted to a mini-spa night at home, or at a slumber party with others from your prom group. Tweeze, shave, do a soothing face mask, or whatever you want to do to prepare – but do NOT bust out that new moisturizer you haven’t had the chance to test yet. You do not want to break out in a rash or sudden zits because your skin has a bad reaction to a product you’ve never used before. If you’re taking along a tiny clutch or your phone case doubles as a wallet, this may not take long. You’ll need your ID and ticket at a minimum, though you may want to cram in a pack of tissues, some lipstick, mints, and a spare tampon in case you or anyone in your party might need it. Double check your dress for any holes, missing buttons, or loose threads and then carefully hang it up after trying it on one last time. Get your shoes and accessories staged in one place. Charge your phone! Show up on time and let yourself be transformed at the skillful hands of your stylist. Use the time your nails are drying to take a few deep breaths and calm yourself. If you’re doing your own hair and makeup, meditate a little to de-stress and get excited about the night to come! Let yourself feel beautiful. Don’t worry, you’ll look great. This is a small, easily-overlooked step, but it’s hugely critical. Put on deodorant or antiperspirant before leaving. It doesn’t matter how thickly you lay on the perfume. Prom is a stressful, exciting night involving you in a sleeveless dress in a humid, overpacked ballroom or school gym. You will sweat. You need deodorant. You and everyone around you will appreciate it. Prom is a crazy, hectic time – so please don’t forget to have fun! Even if you chip a nail, even if the music is terrible, and even if you forget the deodorant, try your best to enjoy prom for what it is. Focus on remembering the good, not the bad. We put together this list to help you organize what to do, not overwhelm you with information. Don’t feel like you there’s anything you have to do in order to have a successful prom night. The only thing you should do is relax!